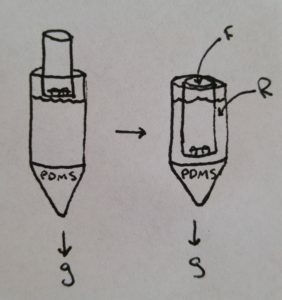 The earlier work used Josh Winan’s jury-rigged PDMS-filled reverse centrifugation setup, but despite the primitive design we saw a definite improvement in yield when using reverse centrifugation as opposed to forward or standard benchtop centrifugation. 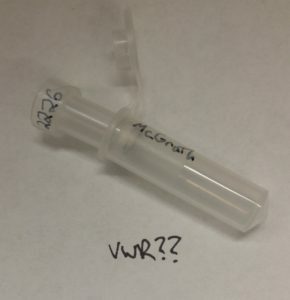 But going forward, we definitely need a dedicated Sepcon-style vial for these separations. We’ve chosen to shoot for 90% reduction in impurities in a single run.To understand this, consider a hypothetical purification run. Assume we start with a 100 mL solution composed of 10^5 part/mL conjugated antibodies (yellow circles in animated gif) and 10^5 part/mL free IgG (red dots in gif). Further, let’s say that our membrane is perfect for our separation, meaning free IgG goes through the membrane as if there is no membrane at all, and conjugated antibodies are perfectly held back. 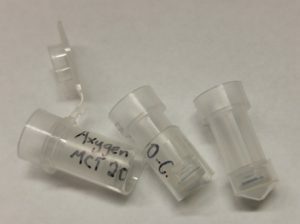 For a 90% reduction in free IgG, 90 mL of solution should make it into the filtrate (containing 90% of the free IgG), and the remaining 10 mL has all of our starting conjugated antibody. 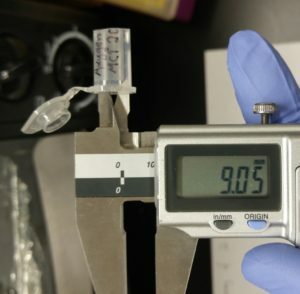 We discard the 90 mL of free IgG in the filtrate. Once we add 90 mL of fresh buffer to our retentate to bring its volume back up to our starting 100 mL, we’re left with a solution with 10^5 part/mL conjugated antibodies (yellow circles in animated gif) and 10^4 part/mL free IgG. This process could be repeated indefinitely to bring the final concentration of impurities below whatever threshold is required. 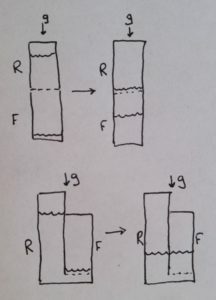 What this means is that for the filtrate to be 9x the volume of the retentate, the volume of the filtrate chamber must be 9x the volume of the retentate chamber plus the dead space below the membrane, which is also part of the retentate. Retentate volume must be fully and easily recoverable. Device must be easy to wet on both sides. 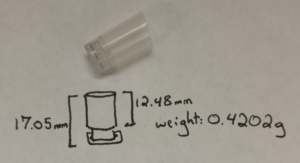 Device must fit inside a standard 2 mL benchtop centrifuge slot (a cylinder 9 mm in diameter and 39 mm in length – see dimensions figure below). 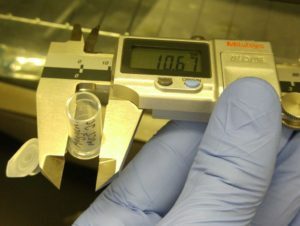 Device must be strong enough to withstand at least 2,000 g when loaded with sample. Device must not leak (gaskets must sit well and be compressed). So h_f ~ 11 mm. 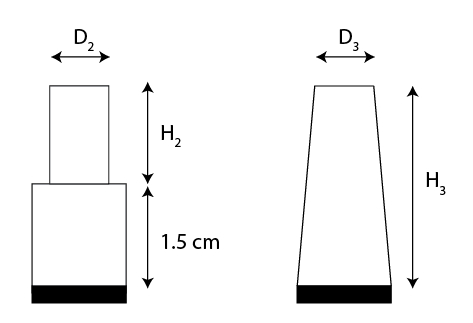 which works out to be about 11 cm tall, much taller than the 2 ml conical. 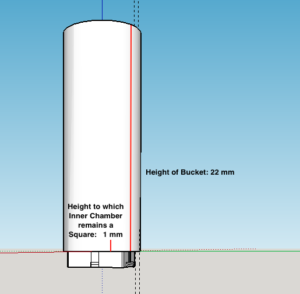 So this impractical to do this for 1 ml within the space of a 2 ml conical. 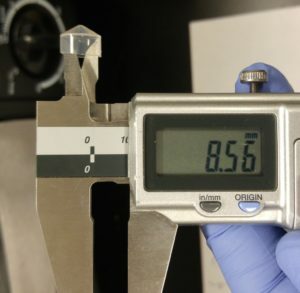 The gap would be roughly R – r = 0.27 mm which is considerably thinner than the plastic wall thickness. 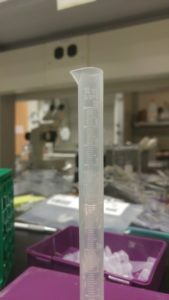 Karl points out that we couldn’t easily pipette in this space but we could load the annulus by compressing the central cup into 1 ml of fluid already in the 2 ml centrifuge tube. Including the thicknesses will consume about 15% of the cross section, so $Latex h_f$ (and $Latex h_o$) would have to increase by another 15% to compensate. The gap would also shrink by one thickness to about The 25 ul dead volume we’ve neglected on the other hand, will reduce both heights. This is only 2.5% of the 1 ml volume however and so the effect will be very small. 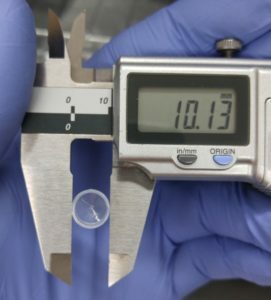 The actually capacity of the system can be found by setting the initial outer fluid height equal to the length of the 2 ml conical (3.9 -0.3 = 3.6 cm). By equation 5, this works out to be about 325 ul. 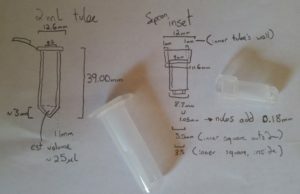 I did a brief survey of 5 different manufacturer’s 2 mL tubes. 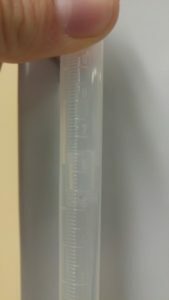 This is by no means exhaustive – I simply bothered my friends in the medical center and asked if I could steal a 2 mL tube off them. Next I tried inserting bottom buckets into the vials. 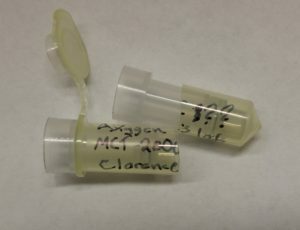 If they fit in the top, I cut the vial in half and tried to fit them in the bottom half. An alternative design that provides for a larger capacity employs a moving inner chamber. This approach is inspired by a design by Satorius and is the configuration used by Josh Winans in our 2016 JMS paper in which he showed the benefits of ‘reverse centrifugation.’ Both the fluid and housing move in this design and so the dynamics are complex (more later). 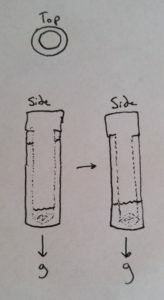 If the inner bucket is allowed to protrude outside of the 2 ml conical at the start there should be no problem starting with 1 ml. Surprisingly, our past experience suggested that the upper basket does not fall out during the spin despite the fact that it begins floating like a fishing bobber. There are two hazzards to design against. First, if the fluid rises too quickly in the gap between the inner and outer chamber, some sample will spill out of the device. Second, if the inner chamber is too short, this same fluid might spill into the inner bucket mixing the sample with the filtrate. that at least some of the time the upper basket would fall out. Since we are using the same chambers as in the static design above, the final spin height $Latex h_f$ will be 2.6 mm. 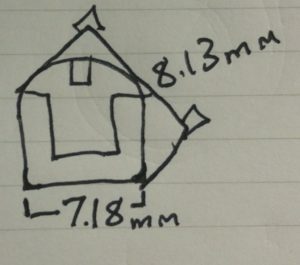 An inner chamber height of say 3 mm would seem to eliminate this second possibility. Eliminating the first possibility is much trickier since it depends on the relative rate of the water rise and the basket fall. This in turn depends on the hydraulic permeability of the membrane. So a complete analysis requires that we consider the system dynamics. But we can at least assure ourselves that the starting configuration doesn’t lead to spilling. Measuring the weight of one of Josh’s upper baskets and the weight of a given small chunk of that basket allows us to calculate the weight of a bucket of an arbitrary length. 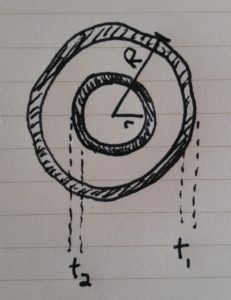 What this means is that at the start of the spin, when no water has entered the upper chamber yet, the upper chamber will sink until it has displaced an amount of water that weighs the same as the upper chamber. 0.806 g of water is 806 uL of water. Given that the outer annulus only has a volume of 325 ul, the prediction is that the chamber will spill over before the spin begins. First image shows a narrow measuring tube. Second and third show the narrow measuring tube with one of Josh’s sliding sepcons floating in it. Note how low in the water it sinks, and how high up the sides the new water level creeps. 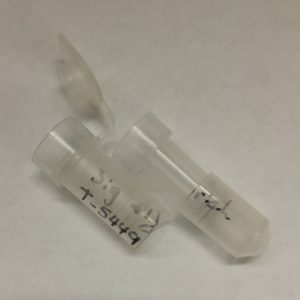 Since the capacity is limited by the initial height, a possible solution is to create a step or tapered inner bucket that allows for a 1 ml initial volume on the outside and a 1 ml final volume on the inside. The design should maximize the height of the initial fluid column to maximize the initial head pressure. 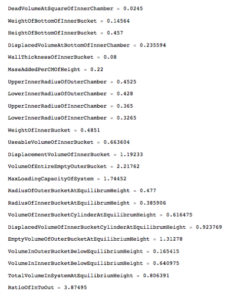 If we set $Latex h_2$ = 2.1 cm (the remaining height of the bucket), I get r = 0.37 mm, so $Latex D_2$ = 7.4 mm. 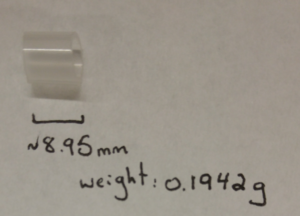 This design is quite conservative as it ensures a 1 ml+ outer volume in the top half of the annulus alone. 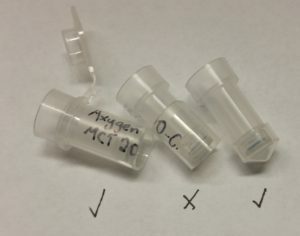 The following images are from a moveable inner basket designed to fit inside a standard 2 mL tube (which has an inner diameter of 8.6 mm and a length of 39 mm). 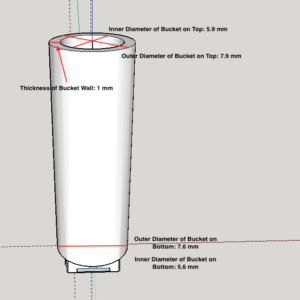 The weight of the inner bucket has never been more than ~.8 g, meaning we should be able to load the 2 mL bucket with 1.2 mL of fluid, then put the inner bucket in, and the fluid level – no matter how hard we spin – will be below the lip of the 2 mL basket. 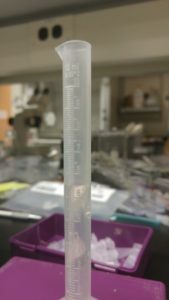 Having a processing capacity of 1 mL should be pretty straightforward. 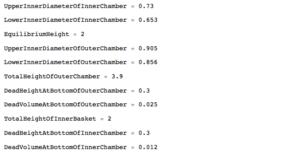 I’ve done some modeling in Mathematica that allows us to calculate the relative volumes in the filtrate and retentate given the geometry of our system. The Mathematica file is here: (Drive link, since wordpress hates .nb files), and is also in a .txt format here: mathematica-code. I’ve deliberately written it to be as human-readable as possible. Karl is the 'separations czar' for NRG. As a Biophysics Ph.D. Candidate, Karl has the responsibility of characterizing new membranes, modeling the unique physics of nanomembrane separations, and finding ways to apply pnc-Si technology to protein purification, nanofluidic transistors, and human hemodialysis. Karl graduated from Allegheny College in 2011 with a double major in English and Physics.